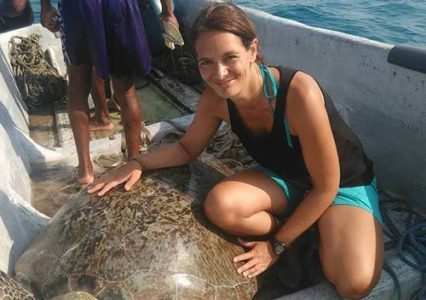 Joana Hancock pursued the dream of working with marine life since an early teenager and became a sea turtle conservation biologist in 2002. After joining her first sea turtle project in Crete, Greece there was no turning back. From 2003 to 2009, Joana coordinated or assisted several WIDECAST and Smithosonian projects in Costa Rica and Panamá. Working with leatherbacks, greens and hawksbills, the projects monitored nesting and performed in-water research. After that, Joana travelled to Cape Verde in West Africa in 2009 to coordinate a loggerhead conservation project. 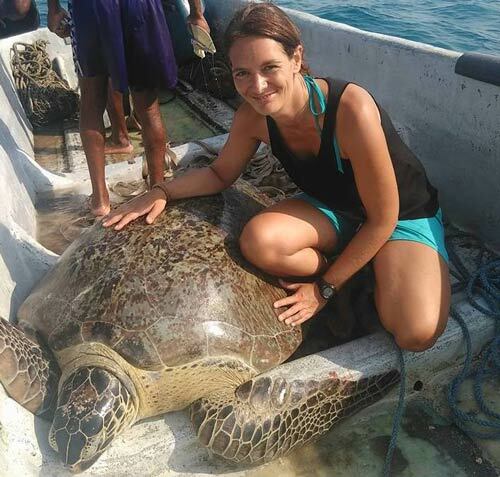 The unregulated sea turtle harvesting there motivated Joana to conducted her MSc thesis on illegal trade of this species in this archipelago with the University of Exeter. Joana is currently member of Central Africa’s sea turtle conservation network (RASTOMA) collaborating with projects in São Tomé and Príncipe, Cameroon, Republic of Congo amongst others. Joana joined ORP in Diani Beach in Kenya in November 2018. Here she will assist as a sea turtle biologist in the first in-water assessment of green and hawksbill turtles on Kenya’s reefs. In addition she will support local sea turtle initiatives as required.